Call me homesick for a good read, but this favorite and familiar author – Alice Munro – came through for what ailed me. Her latest collection, Dear Life, was the recent selection for my book club and neither the book nor our discussion disappointed. 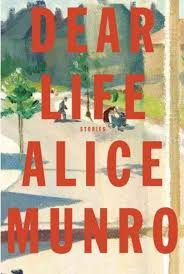 The primary section of Dear Life consists of ten stories – all typical of Munro’s style. She crafts believable characters in unremarkable situations to achieve thoughtful and real episodes of poignancy. Not unlike Flannery O’Connor who allows all of her main characters a moment of grace to accept or deny, Munro’s characters are given choices and the consequence thereof creates her story. What makes this collection particularly interesting are the final four stories that are – by Munro’s admission – as close to autobiographical as any writing she ever plans to do. So for those who crave a glimpse into their favorite writer’s background, hoping to find the breadcrumbs for what makes a writer, these stories help to fulfill that longing. Dear Life provided our book group one of the best discussions we’ve had in a long time. Admittedly, we put more preparation into it than we typically do, but nonetheless, it worked. We divided the collection among four of us. We were responsible for writing a 2-3 sentence summary (so as to remind us all which story it was) and then note a couple of themes that tied them together. By the end of the evening, we had a list of ideas that tie the stories together. If you are looking for a good read or your club is looking for a great source of discussion, I don’t think you can go wrong with Munro’s Dear Life.